A few weeks back, P&PC received the following letter from Ernest Hilbert— Phila- delphia- based poet, blogger, and editor of the Contemporary Poetry Review—which pleased us to no end. It's not often that the office gets mail, let alone fan mail, let alone fan mail with photos, let alone fan mail about Joyce Kilmer with photos of the Joyce Kilmer Service Area in New Jersey (pictured here). Talk about making us feel special! Here's that letter and our response. We're sorry it's taken so long for P&PC to reply to your letter, but your note drove us deep into the office archives in search of some items that might help return your kindness. Rest stops named after poets are not entirely unheard of and, in their own artificially-lit ways, ask us to pull off of the standard literary-critical interstate, grab a Snickers bar, and think seriously about what it would mean to measure poetry as Walt Whitman proposed in the Preface to the 1855 Leaves of Grass that it might be measured. "The proof of a poet," he wrote there, "is that his country absorbs him as affectionately as he has absorbed it." 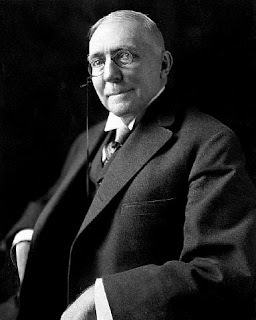 Take the "Hoosier Poet" James Whitcomb Riley, for example, who, if the P&PC office research team is not mistaken, has a rest stop named after him in Indiana. Riley has been left off of most maps of American poetry despite (or because of?) the way he's been absorbed by the rest of America. Did you know, for example, that Riley's 1885 poem "Little Orphant Annie" was not only made into a 1918 movie but then became the inspiration for naming Harold Gray's daily comic strip—itself the subject of more movies, plus radio and tv shows? Pursuing Whitman's standard of measurement, one might say that Riley was so absorbed by his country that he's nigh disappeared. There's not only a rest stop named after Kilmer, but schools, a forest, and even Camp Kilmer in New Jersey which, according to Wikipedia, was "activated" in 1942 and became the largest "processing center" for U.S. troops heading out to, and returning from, Europe during World War II. We here at P&PC find it especially despicable that, as the matchbook pictured to the left and above indicates," "Trees" was pressed into propagandistic service of these military activities. Here, via the arboreal imagery on the booklet's cover and the Kilmer poem printed inside, Camp Kilmer is not at all being presented as the site for massive military operations that it actually was, but as a sort of poetic summer camp instead. Back in the day, though, lots of poets wrote poems praising trees, and poems were frequently read at Arbor Day or tree- planting celebrations all around the U.S. In 1927, for example, graduating high school student and future director of the Iowa Writers' Workshop Paul Engle would himself pen "Dedication Poem Read at the Planting of the Cedar by the Class of 1927." 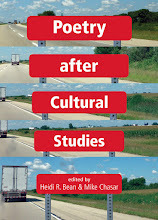 (A copy of that poem is included in Engle's papers at the University of Iowa Special Collections, so you can check it out for yourself the next time you're in Iowa City.) And, if you take a closer look at the upper left-hand corner of the braille-scrapbook page (pictured here), you'll find yet another tree poem—this one a translation of a poem first written in Norwegian by 1903 Nobel Prize for Literature winner Bjornstjerne Bjornson. Apparently, the market for tree poems was so robust around the turn of the century that the U.S. began importing them! If you want to be even more convinced of this tree-poem phenomenon, check out all the verse in the 1896 "Annual Program for the Observance of Arbor Day in the schools of Rhode Island" which includes—you better believe it!—the very Bjornson poem collected in this scrapbook alongside Kilmer's "Trees." 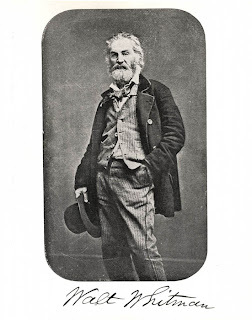 If these examples suggest how "Trees" was part of an entire genre of leafy poems—not unlike Whitman's "I Saw in Louisiana a Live-Oak Growing," perhaps—that were fully and continually absorbed into U.S. culture, then the album page pictured here (taken from a different scrapbook altogether) indicates the singular importance of Kilmer's "Trees" to that genre. Take a look at the item pasted on the left-hand side of this scrapbook page, for instance, where the album's editor has placed an article about the "breath-takingly beautiful" royal poinciana tree. Not only does that article take its title from Kilmer's "Trees," but it then quotes the last two lines of the poem as the definitive word on metaphysical dendrology. "The royal poinciana," the author writes, "is so radiantly lovely and so flamingly vivid and gorgeous that one can scarcely bear to take one's eyes off it. The sight of this tree in its springtime robe brings to mind Joyce Kilmer's appreciative and immortal words: 'Poems are made by fools like me, / But only God can make a tree.'" So, we've come a long way from that New Jersey rest stop, Ernie, but we hope it's been worth the ride and that we've convinced you that a school of criticism taking Whitman as its source is not only a viable, but also a valuable, way of tracking how our literary heritage speaks through our culture—just as Kilmer spoke through you between Interchanges 8 and 9 on the New Jersey Turnpike. Make sure your lights are on, and drive safely. To recognize and help celebrate the start of the 2010 Vancouver Winter Games, P&PC goes into its archive to reprint this posting on Olympians and Olympic poetry. May "Amazing Await" us all. after training for it all our lives. it awaits in our Olympians. and the glory of pursuit. The inclusion of "Amazing Awaits" isn't gratuitous, nor does it disrupt the overall rhetoric of Corn Flakes. Kellogg's printed an order form for a free Michael Phelps poster on the inside of the box, so it took little in the way of extra time or money to print the poem there as well. As the order form suggests, the lion's share of the box's rhetoric works to direct the consumer's attention toward the morning goodness inside the carton: the order form is inside, the nutritional information focuses on the contents ("Corn used in this product contains traces of soybeans"), five of the six pictures of Phelps show him in the water, a sentence printed near the tab instructs the hungry breakfaster how to open the box ("To open, slide finger under tab..."), and a little blurb cautions us against accepting poseur cereals: "If it doesn't say Kellogg's on the box, it's not Kellogg's in the box." Kellogg's and Phelps share a predilection for, and particular expertise with, the preposition and prefix "in." Kellogg's is occupied with ingesting. Phelps—the swimmer and recreational user, natch—is in the business of inhaling. —that repeat the central trope of inspiration illustrated so well by the amphibious Phelps who, in two pictures, is gulping air as he swims. Along the way, of course, Kellogg's is managing to make its product not just a source of Olympic and national inspiration but also a means by which hungry Americans can participate in Olympian endeavors themselves—via, well, whatever bowl they happen to have at the breakfast table.